People gather at the General Assembly, prior to a vote, Dec. 21, 2017, at United Nations headquarters in New York. Three African nations singled out for their track record of voting against the U.S. at the United Nations say they stand by their votes — even if those choices may result in the U.S. cutting back on aid. U.S. Ambassador to the United Nations Nikki Haley made the threat to cut aid in a written statement last week after the State Department released its annual report on U.N. voting trends by member countries. Among the 10 countries listed on the annual State Department report that tracks U.N. voting patterns are nations that have long opposed U.S. interests, such as Iran, North Korea, Cuba, Venezuela and Syria. This year’s list also included Burundi, South Africa and Zimbabwe. “The American people pay 22 percent of the U.N. budget – more than the next three highest donor countries combined,” Haley said. “In spite of this generosity, the rest of the U.N. voted with us only 31 percent of the time, a lower rate than in 2016. … this is not an acceptable return on our investment." "President Trump wants to ensure that our foreign assistance dollars – the most generous in the world – always serve American interests, and we look forward to helping him see that the American people are no longer taken for granted," she added. FILE - United States Ambassador to the United Nations Nikki Haley speaks during a Security Council meeting, April 10, 2018, at United Nations headquarters. Zimbabwe’s government spokesman, George Charamba, literally laughed aloud when VOA asked him what he thought of Haley’s statement. Zimbabwe, a longtime critic of the United States and the West, already is under heavy international sanctions anyway, he added. Once he stopped chuckling, Charamba explained why Zimbabwe so often disagrees with the United States. He noted that Zimbabwe stood firm by its decision in 2017, to abstain from a U.N. vote to condemn Trump's policy recognizing Jerusalem as the capital of Israel. The motion passed, with only nine nations -- including the U.S. -- voting in favor of recognizing Jerusalem as the capital. South Africa, which says it has good relations with the United States, also has voted against the U.S. in votes on international human rights abuses, often aligning with China, Cuba, Saudi Arabia and Venezuela. But Ndivhuwo Mabaya, spokesman for South Africa's Department of International Relations and Cooperation, says his nation will not be swayed. “You cannot do diplomatic relations based on bribery,” he told VOA. “... It is the level of diplomatic relations that South Africa cannot be involved in. We, as a sovereign state, we have got positions on a number of issues. We have got our own national interests, we have our own [Southern African Development Community] and regional interests." Burundian officials, who have previously lashed out at U.S. attempts to cut aid over alleged human rights violations, said they could not comment Wednesday. 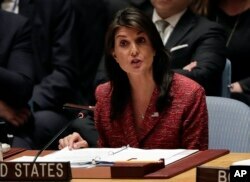 Analyst Jakkie Cilliers of the Pretoria-based Institute for Security Studies said Haley’s words are unlikely to go over well in countries that have long been courted by other powers, like China. “Money and diplomacy are never far apart,” he told VOA. “But the United States is the only country that really places this so firmly, and publicly, on the agenda — that is, that countries that do not support us in the [U.N.] General Assembly or elsewhere will not get money, or development assistance through USAID [U.S. Agency for International Development] or elsewhere. The United States provides hundreds of millions of dollars in aid each year to those three African countries. It goes, among other things, toward improving HIV/AIDS prevention, economic growth, agriculture, food security, refugee assistance, education and maternal and child health.